All is not well in the world of mooncakes. First came the scandals about unhygienic fillings for the popular gifty treats given during the Chinese harvest festival (aka Mid-Autumn Festival). 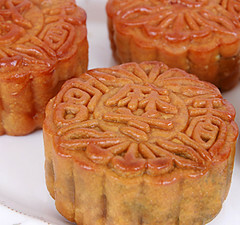 Common fillings are lotus seed, bean, or jujube pastes, sometimes with nuts, enclosed in a pastry crust with pretty embossed graphics and characters. Urban myth meets reality here, with the Chinese government finally starting to crack down on makers who store piles of unused fillings on warehouse floors all year, then mix that gnarly old stuff with newer ingredients for the new cakes for fall. Eew! But now there is a new controversy. The government plans to tax the employees who receive such gifts from their bosses! As a taxable benefit (now, doesn’t that sound American? ), that means the employee receives a food gift, and then has to pay money for the tax! Fuggedaboutit, say the employees, just give us a cash bonus and tax that! The photo here is from Asian Food Grocer. Note that the mooncakes often come in beautiful keepsake tins. For information about the Moon Festival and some of the legends associated with it, check out this site.